Posted: Tuesday, February 13, 2018 12:20 am | Updated: 4:01 am, Tue Feb 13, 2018. St. Petersburg Borough Council and its water authority are moving ahead with a plan to build a new water treatment plant and replace several water line mains. Very preliminary estimates put the cost of the project at between $1.5 million and a little over $2 million. The system serves about 193 active customers out of 201 accounts. Thirteen of those water accounts are in Richland Township, however, township officials have no role in the water authority or its system. The new treatment plant will be located near the existing facility. St. Petersburg Borough Councilman Denny Logue also is the borough's water plant operator. "It's deteriorating," Logue said of the water system. "It's worn out. When it was built, they used steel pipes. The chemicals we use for water treatment and the soils have eaten the pipes up. We're looking to go with stainless steel pipes which will last a long time." St. Petersburg Borough Council President Barry Sullivan estimated the water system is about 55 years old. Sullivan said if the planning, financing and bidding go as planned, the project should be started and finished in 2019. Logue said replacing the treatment plant turned out to be the only viable option to making sure the residents of St. Petersburg would continue to access to potable water. 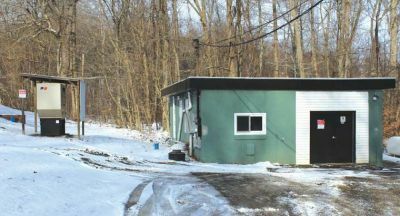 Council member Richard Feicht said the state Department of Environmental Protection has "strongly suggested" for several years that the borough upgrade or replace the water treatment plant. "So, we're trying to be pro-active instead of reactive," said Feicht. Logue said the borough considered selling the system to a larger water company with more resources to improve it, but that plan was not to be. "We talked to Pennsylvania-American Water and Aqua American," said Logue. "PAWC doesn't have any systems close enough to tie into." Logue said Aqua American was interested in obtaining the St. Petersburg system. "Aqua American wanted it," said Logue. "They wanted to run a line up out of Emlenton, along (State Route 437) into St. Pete and then down to Foxburg." Logue said Foxburg officials declined to be part of that project and without Foxburg's participation the project was not feasible for Aqua American. While St. Petersburg and Foxburg share a sewerage treatment system, Logue said the St. Petersburg water system is not large enough to serve Foxburg. "They (Foxburg) have the hotel and all those shops down there and the (Allegheny-Clarion Valley) schools we just don't have enough water to send down there," said Logue. The St. Petersburg water system is fed by two springs and a well. The water is held in a pond before flowing through the treatment plant. "We have seven or eight million gallons in the pond," said Logue. "That's not enough for both towns. "If they (the state Department of Environmental Protection) would let us draw out of the Clarion River we would have all the water we need." Paying for it It's still too early to accurately predict what the project will cost or how it will affect customers' water bills. Logue said the $1.5 million to $2 million estimate for the new treatment plant and main lines should be pretty close to the final cost and in the "big picture," is a rather small project. Logue said the borough officials are hoping to secure 70 to 80 percent of the costs in grant funding and the rest in low-interest loans through the state's PennVEST program. "If we can't get there the first time around, we can reapply for the grants and financing," explained Logue. "If the project estimates come significantly higher, we can cut down on the replacement of the lines." · Met in executive session for about 10 minutes before agreeing to "place a letter in the records of two employees" who violated borough guidelines. · Reminded residents Columbia Gas will doing a service replacement project this upcoming summer along Church, Grove, Short and Hill streets. · Acknowledged all loans taken out by the borough for various equipment and building projects have been fully paid off.